Leeds was one of several operators initially not persuaded by the AEC “new look” front end (a preference with which I entirely concur), and its first Regent V deliveries retained the classic radiator design and hence the outward general appearance of the Regent III. 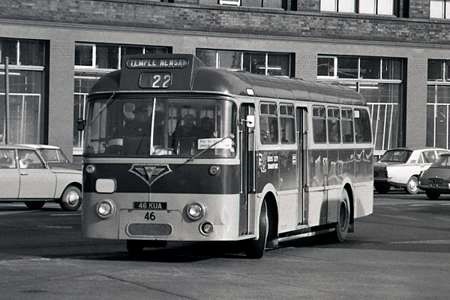 These buses were of the MD2RA air braked specification of which Leeds became the largest customer, being powered by the AV470 7.7 litre engine driving into the four speed Monocontrol transmission. They were delivered in two batches, all with handsome, traditional Roe H33/27R bodywork. WUA 760 to 839 (with corresponding fleet numbers) came into service from January to November 1956, and XUM 840 to 894 arrived between March and October 1957. In the photo above, XUM 888 is seen in April 1970, four years before Barbara Castle created the heavy and inefficient hand of the West Yorkshire PTE that was to fall upon the municipalities of Bradford, Calderdale, Huddersfield and Leeds. I understand that these buses did not long survive in PTE ownership. Geoffrey Hilditch paints a revealing picture of the dire financial performance of the PTE in his “Steel Wheels and Rubber Tyres, Volume 3”. Later still, of course, another dogma driven politician of the opposite persuasion, a certain N. Ridley was to wreak even greater devastation upon the entire bus operating industry outside London, a saga that has previously been discussed at length on this forum. These buses were all withdrawn before PTE days. The last of the WUA batch had gone by April 1973. The XUM batch had perished earlier, all bar one (accident damaged) in 1971. These small AECs flattered to deceive they had an attractive body but were of light weight construction and when idling in later years the rattles were almost syncopated In addition because Leeds were frugal with fuel a fully laden example could really struggle on the most gentle of inclines For some reason they always seemed to really lean into corners perhaps due to their lightweight construction I well remember one occasion when one really heeled over at the bottom of New York Street in the city centre so far over did it go that the platform was causing sparks to fly from the road surface and was leaving gouges in the roadway! Chris, I recall that our highly respected and informed contributor, Chris Youhill, once commented on this forum about the distressing propensity of Leeds City Transport to cut down the engine fuel pump settings on this fleet of Regent Vs. These buses, with their modest AV 470 power units, must have been truly pathetic performers after the fuel pumps had been reset to "economy" levels. 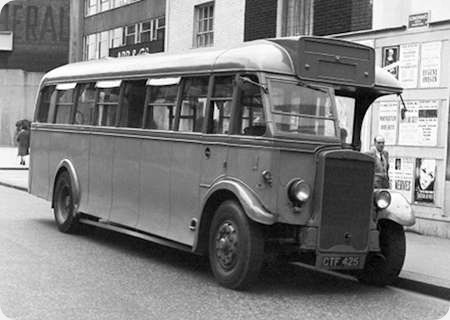 Yes, for years, a great many Bristol double deckers got along (albeit steadily) with the 94 bhp 5LW, but, in my experience, AEC motors were never remotely in the same low speed torque league as the Gardner. 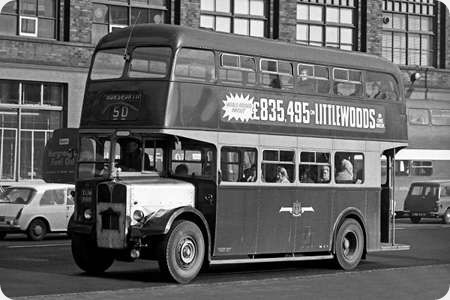 A feature of Leeds buses of yesteryear which always mystified me on visits to the city as a young lad was the unpainted bonnet cover on PDs & Regents of LCT. Nobody has ever given me a proper explanation as to the reason for this, somebody said it was so the fitters did not scuff the paintwork if the bonnet had been painted when working on the engine, but I do not know how true this is. This was always given as the reason It survived three managers so was certainly a proper policy rather than a managerial whim and was in use in prewar days. Even the last batches of enclosed radiator AEC Regents with enclosed radiators had the feature The nineteen fifties and afterwards Daimler’s and the PD3As had green bonnets oddly the Crossleys also had painted bonnets.